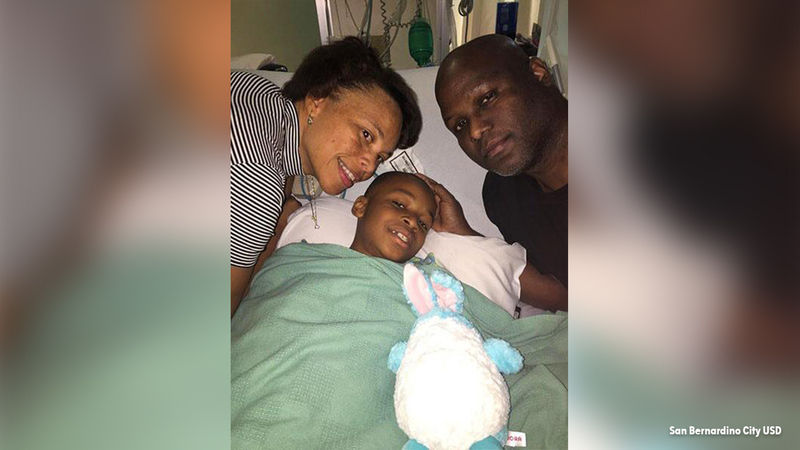 SAN BERNARDINO, Calif. -- The 9-year-old boy injured in a murder-suicide shooting at North Park Elementary in San Bernardino is recovering, according to his parents. The San Bernardino City Unified School District posted a photo on Facebook of a smiling Nolan Brandy with his parents, Leon and Rachel, saying that the family wishes "to thank the community for the outpouring of prayers and support they have received." "They are happy to inform everyone that Nolan, 9, is recovering well," the post said. Brandy suffered a gunshot wound Monday in his classroom when his teacher's estranged husband walked in and gunned her down, killing her and one other student who was standing close to her. Eight-year-old Jonathan Martinez was rushed to the hospital along with Brandy, but died before reaching surgery. After killing teacher Karen Smith and wounding the two boys, 53-year-old Cedric Anderson turned the gun on himself. Brandy's family asked for continued prayers for the families of victims Jonathan Martinez and Karen Smith. "We are grateful," they said.